It's been quite a long time since 50 Cent had any major success on the music side of his career, but his work as a grimacing internet troll is in top form. When JAY-Z's 4:44 first dropped, 50 said it sounded like "golf course music." He's now explained those comments — and doubled down on the dig — in a new interview with Conan O'Brien. 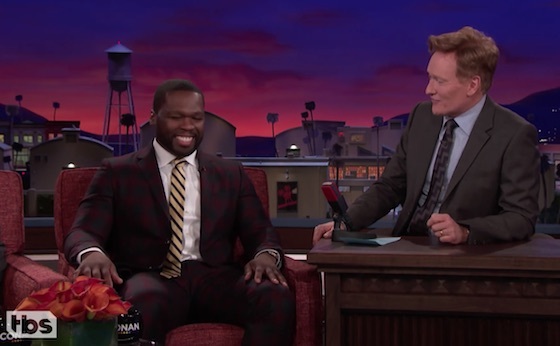 Appearing on Conan to promote his new film Den of Thieves, Fiddy was asked what he meant when he called Jay's album "golf course music." "Hip-hop culture's connected to youth culture," he said. "The kids gon' bring new innovative stuff. He just had the maturity bleed off into the material. So you look at it and go — it's cool for me, like, in my car I'm listening to it. But the kids, I don't see them actually listening to it." Then 50 dropped a devastating Fresh Prince-themed dig. "I felt like Carlton Banks when I was listening to it," he said. Watch the hilarious Conan interview below. Check out 4:44 for yourself by ordering it on CD via Umusic.